I am snowed in and can't get out! There's like a foot of snow here, well maybe 8 inches, and it's still snowing. I'm in Jersey as we speak, or as I speak, or as I type I mean! No better way to start this housebound day than blogging for you. 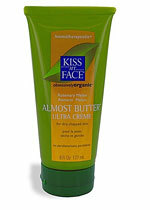 Someone pointed my attention recently to ALMOST BUTTER by KISS MY FACE. The 6 oz Rosemary Melon scented Ultra Creme is "obsessivelyorganic" (sic). Unfortunately, someone at the Kiss My Face corporation isn't disclosing their ingredient listings with the same obsession. Here's a great example of even one of the bigger companies just getting it plain wrong and then some! I was actually so bewildered by this product (which claims it is 99.9% natural) that I bought it so I could have some hard evidence that I wasn't making up the ingredient listing!! Let's get started shall we? Juniperus Oxycedrus*, Melissa Officinalis*, Lavandula Angustifolia*, Aqua/Eau, Chamomilla Rectuta*, Angelica Archangelica*, Althaea Officinalis*, Avena Sativa*, Helianthus Annuus*, Glyceryl Stearate, Cetearyl Alcohol, Cetearth-20, Glycerin, Caprylic Acid, Butyrospermum Parkii, Jojoba Esters*, Glycine Soja*, Olea Europaea*, Theobroma Cacacao*, Rosmarinus Officinalis, Citrus Dulcis*, Citrus Nobilis, Cucumis Melo, Glycine, Xanthan Gum, Cyanopsis Tetragonalba, Tocopherol. *Organic ingredients are Certified by Quality Assurance International. First of all, thumbs down for not "translating" some of these ingredients to plain English! Let me take a moment to decipher these. Juniperus Oxycedrus is Juniper (oil, extract, who knows with this label). Melissa Officinalis (Melissa flower, again oil/extract who knows). Butyrospermum Parkii is just shea butter. Glycine Soja is just soybean oil. Olea Europaea means olive (olive what, we don't know since it's not listed, but probably olive oil). I hope you haven't given up on me yet because that was just identifying the ingredients! Well, today we'll cover part one of this error strewn label. You already know that ingredients are listed in order corresponding to it's amount in the product (until 1%). Click here for an introductory post on reading labels. Is there really more Juniper, Lavender, and Melissa in this product than water?!?!!? Impossible! For just so many reasons. And if there really was that much Melissa and Juniper and Lavender the product would be popping with color and smell to high heaven. Oh, BTW, the product does smell amazing though! The only thing that would make sense is that they might have used the floral waters of these ingredients. In this case, they should have noted it as such, nevertheless, it is still incorrectly labeled! We know as well that a moisturizer is basically oil & water with added extras. This ingredient listing doesn't list a single oil (one that you can actually use in a moisturizer) until sunflower oil, which is way down on the ingredient listing. Thus, the label tells us that there is actually more Juniper, Melissa, Lavender, Chamomile, Angelica, Oats, and Marshmallow than the next listed Sunflower oil. Impossible. What an insane formula that would be! If the list were true, this certainly wouldn't be a moisturizer that anyone would dare put on their body. Unfortunately, the most serious mistakes made on this label seems to have been done deliberately (and will be covered in part 2). This is way sad, especially with KISS MY FACE, I mean, what a cute brand and a great story behind it :-( But, better not rush to any judgments yet. I've contacted the company to get further clarification and a statement from them. I'll keep you posted. 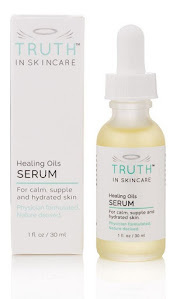 Nevertheless, I can not tell you how happy I am to be able to share with you some tips and knowledge on these skincare/marketing matters. I hope that I am able to be at least a little helpful. I'm just glad that we can have a shared platform into seeing the good and the bad out there in the market. Thanks for listening, I think I'm already getting cabin fever! Time to shovel some snow. Anyway, out of curiosity and with you being a doctor, what is your take on the post I recently did on johnson & johnson's advanced healing band aids? I'd like to hear your opinion! THANK YOU!!! I just bought Kiss My Face "Natural" and "Organic" (although I will say the Amazon seller seems to have added the "Organic" part) Sport Lip Balm... which has Avobenzone in it!?! My fault for not looking up the ingredients before purchasing, but I was so irritated to purchase based on the claims and then when it arrived to find not only Avobenzone 3%, but Homosalate 8%, Octinoxate 7%, Octocrylene 2%... which may be organic compounds, but aren't exactly thought to be safe, from what I'm reading.